Chad has a decade of experience in the oil and gas industry continuously holding roles of increasing responsibility in project management, strategy, development and leadership. 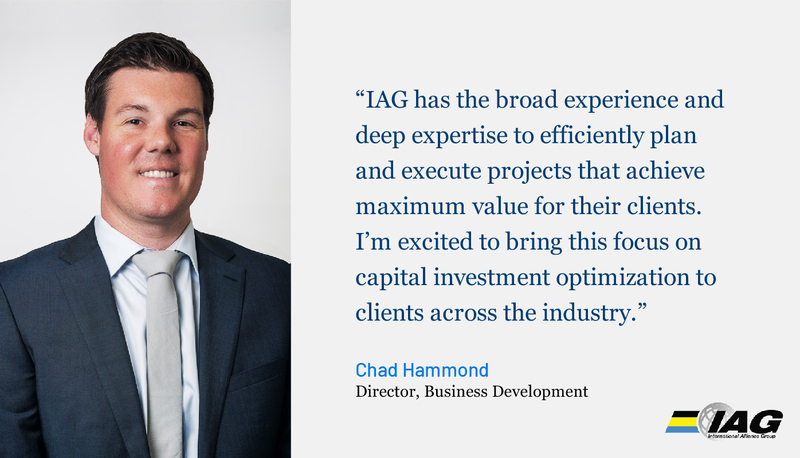 As Director of Business Development, Chad is responsible for client development, expanding into new markets and integrating new innovations and technologies into IAG’s client solutions. Prior to joining IAG, Chad worked with Parsons for seven years where he was recognized as a future leader and served as a project manager, global account manager, and lead strategic efforts for Parson's re-emergence into oil and gas. He also expanded services with new clients and into new geographical locations. Chad is a graduate from California Polytechnic State University, San Luis Obispo (Cal Poly SLO), with a bachelor’s degree in engineering, as well as a minor in construction management with an emphasis on business.